This cookie recipe is from the Neiman Marcus cookbook. It is not the same as this one, and I don’t want to perpetuate that myth, so here’s the recipe as written by Katy G. who has excellent taste in cookies. I followed the directions, but left out the espresso, used dark brown sugar instead of light and some cut up Dove bars in place of chips. The Dove bars were a little melt-y, but people like that sort of thing so all was well. Next time I’ll try the Mocha Cookies with a different kind of chocolate and I will NOT leave out the espresso. 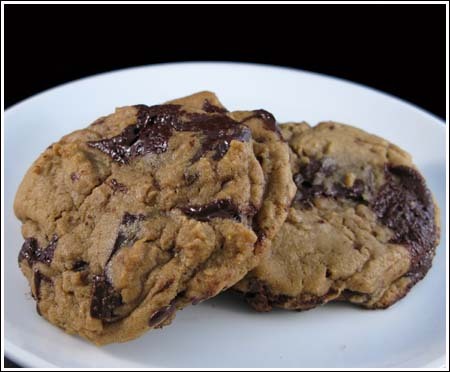 Different from the urban myth Neiman Marcus Cookies (the ones with ground oatmeal), this recipe is adapted from the Neiman Marcus cookbook. They are regular chocolate chip cookies flavored with espresso powder. This recipe calls for less butter than most, so make sure to measure the flour with a light hand and use all of the chocolate called for in the recipe. Beat in espresso powder and vanilla. Add egg and beat until thoroughly smooth. Scoop into very large walnut sized balls. Flatten slightly. Bake for about 20 minutes, until set and very slightly golden around edges. Alternatively, you can just bake them at 375 for 8 to 10 minutes. Oh my word, I made these this weekend for my dad and they are SOOO good! I will be making them again sometime. Perfect texture. And my brother’s girlfriend, who doesn’t like coffee, kept the one’s I gave to her instead of sending them home with my brother…much to my parents’ chagrin! Hmmmm…these are interesting. Just made them–they are a little too dry for me I think (but perhaps I had a heavy hand with the flour today? I didn’t weigh) The dough tasted fabulous and I loved the espresso flavor, but it mellowed quite a bit during baking. I almost can’t taste it now. On the up side, they look fabulous. Nice and thick with crackly tops! Use fine grain sea salt or regular supermarket salt for baking. Kosher salt measures differently so is less salty teaspoon for teaspoon. Coarse grain sea salt is for finishing savory food, with the exception of things like salted caramels or Dorie Greenspan’s World Peace cookies. Alison, if I can think of any more festive desserts for this weekend, I will let you know. This morning I’m going to make some cashew bar cookies. They’re not very festive, but I’m dying to try them. Anonymous, thanks for the comment! It’s nice to hear from people who’ve used some of the recipes here. As for sea salt, honestly, I usually just use Morton Kosher or plain old table salt. If I’m lucky enough to have it an a recipe calls for sea salt, I use Maldon. It’s kind of coarse, but not nearly as coarse as diamond crystals. I might treat myself to a jar of sea salt today. love your blog, i use it all the time to get recipe ideas when im in a baking mood. these cookies look fantastic, and i cant wait to try them; however, one question: when you say sea salt, do you mean the coarse, large grain salt? I’m so glad you enjoyed these cookies! I’ve been making them for years. Similar to Jacques Torres’. I was compelled to send the recipe to respond to all the wasted efforts on Levain cookies. I arrived in NY yesterday and went right to Bouchon Bakery to get my chocolate chunk cookie this morning, only to discover that they’ve added a new cookie! Dark chocolate chocolate chunk. Incredible. And they have linzers, oatmeal, the aforementioned chocolate chunk, florentines,and peanut butter filled chocolate cookie eggs. By the way, the NM book has an outstanding oatmeal cookie recipe. Thick and chewy with a cripsy edge like the chocolate chip. Here it is. They are fantastic with chopped dates. 1: Line sheets with parchment. 2: Preheat oven to 300’. 3: Sift together flour, soda and salt. 4: Beat together butter and sugars. Beat in eggs and extract. Stir in flour mixture. Stir in oats and raisins. 5: Scoop very large, golf ball sized rounds onto parchment. 6: Bake for about 20 minutes, until golden. A bit longer for crisper cookies. Steph, thanks for testing the cookies with instant coffee granules. I’m happy to hear they work. Alison, we make hot cross buns here. I tend to bake lemony things at Easter or desserts with Springtime colors. Other people make more brunch type things like deviled eggs, scones, quiches, etc. And then of course, there’s lamb and ham. Most people seem to put a lot of energy into making a big, delicious ham. I think I will make Nigella’s Coca Cola Ham. I have never tried that recipe, Anna, and I’m bookmarking it right now! These look luscious! These look great – I’ll try them later. What do you eat in American over Easter? We have hot cross buns (yeast bread with fruit) and simnel cake (a light fruit cake with a layer of marzipan in the middle and on top, topped with 11 little balls of marzipan to represent the eleven disciples). I’d love to include something from your site for the weekend,what do you suggest? I just finished baking these cookies and followed the small batch recipe. They were really good, nice and thick but also crispy around the edges. I didn’t have espresso powder but substituted instant coffee granules(1 tsp), it seemed to work. It’s a large cookie, so I froze the rest of the dough into balls for another night.